I WAS THE PHOTOGRAPHER OF THE 1947 ROSWELL UFO CRASH WRECKAGE IN THE OFFICE OF GENERAL RAMEY IN FORT WORTH, TEXAS. I HAVE BEEN ASKED TO MAKE A MAJOR SPEECH IN THE LOS ANGELES AREA ON 10-26-96 ON THIS SUBJECT AND AM MOST ANXIOUS TO BE APPRISED OF THE 'LATEST' ON "THE ROSWELL INCIDENT" TO BE INCORPORATED IN THE SPEECH. ANY ASSISTANCE FROM ANY SOURCE WOULD BE GREATLY APPRECIATED. of the downed Weather Balloon, another photo by Mr. Johnson. The two pictures above are two of the photos taken by James for his paper (and in the book's credit, this publication is named), the Fort Worth Star-Telegram, on that fateful day, July 8th, 1947. The Army had just received the wreckage recovered at Roswell (New Mexico) which was almost immediately flown to the Fort Worth Army Air Base earlier. The media was permitted to see a part of the wreckage and talk with members of the staff (although Major Marcel stated in personal interviews long after this date that General Ramey ordered him not to say anything, he just posed for pictures). These two photographs are found in the book The Roswell Incident (by Charles Berlitz and William Moore, pages 32 & 33 in the hardback edition, published by Gossett & Dunlap, New York, NY, 1980). If you would like Mr. Johnson perspective on the photos shown here, he talks about them in an email listed below. It is stated that less than 24 hour after the Army Air Force announced (this annoucement was first issued by the Roswell Air Force base) they had recovered the wreckage of a crashed UFO near a New Mexico ranch, the first photo on the reader's left was released. This picture shows Major Jesse Marcel who was the Air Force officer to go out to the crash site and discovered the debris. This photo was supposed to back up their claim that the wreckage was from a weather balloon. Major Marcel, who was interviewed in this book (also I saw a live interview on the video "UFOs are Real" where again he clearly stated the same points), told the writers that the material he was holding was some of the less interesting parts of the wreckage ... and that although the wreckage looked like tinfoil and balsa wood that in no way did this wreckage resemble such materials. I believe the makers of the movie "Roswell" for Showtime did a good job to portray the uniqueness of these materials ... that they were very light, could not be cut and that the tin type of material when crumbled would come back to its original shape. Going into the second photo, the newsmen present were only able to look at the real wreckage from a distance. Mr. Johnson's recollections of this public meeting were that he was the only media person present in General Raemy's office at the time he took his own pictures for his newspaper and, there have been no other media person -- either a military or civilian photographer or reporter -- identified as being present at any 'Press Conference' at this specific time. 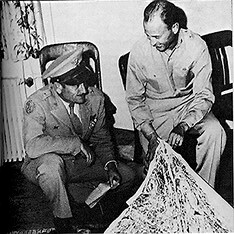 However later, as is shown with the image on your right, they actually brought out material from a real weather balloon (as was reported in the Berlitz/Moore book) and this is what General Ramey (pictured to your left) and his adjutant Colonel DuBose are holding. Berlitz and Moore reported that when this photo was taken, the real "wreckage" was being flown to the Wright Patterson Airforce Base (Ohio) for more serious analysis. We are proud to share on the remainder of this page additional information Mr. Johnson has shared with us via a series of emails related to his experience as a photographer for the Fort Worth Star-Telegram who was present at this press conference on July 8th, 1947. Thanx, Joshua, for your reply re Roswell UFO Crash. I would be Happy to be Interviewed after Tuesday, 10-8-96. Just give a call. Best Time about 0700 Daily. Regards. Joshua, appreciate your interest in the "Roswell Mystery" and your taking the time to pass some questions to me. RE: My BACKGROUND am attaching a recent vita. If you want anything else please ask. As to reasons why I was present to take pix of the wreckage, this has been covered rather extensively in several articles, e.g., Randle and Schmitt's "UFO Crash at Roswell" Pgs 72-74, 76, 208, 275, 285, 292 -- There are several inaccuracies since Randle put words in my mouth to conform to his own theories as to the events (Gen Exon has the same criticism of Randle); Highly Accurate Accounts: "3 Hours that Shook the Press", by Jaime H. Shandera and William L. Moore, Mufon UFO Journal, Sept. 1990, Pgs 3-10; "New Revelations about the Roswell Wreckage: A General Speaks Up" by Jaime H. Shandera, Focus, 1991, Pgs 9-16; Stanton Friedman Resigns from the Fair-Witness Board", Focus, 1991, Pgs 17-22. If you do not have these publications available, let me know. In July of 1947 it was less than two years after I had been discharged from the AAF as a pilot cadet at the end of WWII. In those days generals were highly credible and seldom was their word questioned either by other military types or the media. At the time of the Photo Session in Gen. Ramey's office, it was clear that the smelly debris spread out on the General's carpet was something considered special. At that time and until the present, air crashes are usually set up in aircraft hangers for examination -- not in Commanding General's offices. After I hurriedly developed my photos of the crashed wreckage on the evening of July 8th, 1947, at the Fort Worth Star-Telegram and turned the wet prints -- there was such an urgency to rush the photos into print that there was no time to dry the prints -- over to my city editor and the wire services, I went home. I recall that there was a flood of phone requests from the National Photo Services for "Exclusive" photos but I didn't have any to offer them. The weather ballon cover-up story didn't surface until after I had gone home. It then ran in the A.M. Editions and my photos then didn't run until the P.M. Editions the next day since the crash wreckage had now been "EXPLAINED". 2. That he (Gen. Ramey) put on his class "A" uniform complete with jacket and frame cap for the photos taken in his own office while Col. Dubose, Maj. Marcel and Warrant Officer Newton all were photographed in their class "B" uniforms -- with no hat, tie or jacket. I still believe the General thought at the time of the photo session that he was living an important day in history. Gen. Dubose (later became a General) also has confirmed that theory in his Shandera Interviews. It must have been only after I departed his office that he (Gen. Ramey) that he was ordered by AAF HQ (headquarters) in Washington (D.C.) to issue the Raywin Kite/Weather Balloon Cover-up Story. I know of no evidence that there was a switch of wreckage in Gen. Ramey's office to support the cover-up story. I think it is certainly a mark of the "Times" that the media bought Gen Ramey's sudden cover-up story without any question in 1947. Just imagine what media response would be to such a sudden explanation "Switch" on the part of the Air Force today! And today on such an important story everyone from the President to Ross Perot -- and probably Jesse Jacson! -- Would be thoroughly interviewed Live! (3)Where the Alien Body is or was kept. There seems to be agreement that only the best body was kept and that the other three must have been in very bad shape and probably were not kept. It is also very curious to me that none -- in or out of the Military -- is known to have seen or photographed this wreckage -- or any other "UFO" wreckage -- since that time even though the Air Force no longer claims any secret classification for its several "Captured" UFOs. If the negatives for these Gen. Ramey office photos did not exist in the University of Texas Library archives today, the U.S. Govt. could simply deny that any UFOs had ever been "Captured" and dismiss the whole incident as totally unimportant. I do not have any "Personal Message" I am trying to share. I have never sought any publicity for myself but always have tried to answer all the interviewers to the best of my ability -- and dimming memory! I have not sought to speak on this subject since I had such a brief and realtively unimportant contact. This upcoming speech at the Church in Norwalk, CA, on Oct. 26th was not sought by me but came about only at the invitation of the Pastor. The Roswell Incident really has not affected my life too much. As people have read about my involvement in the Mystery of Roswell, they often have interesting questions. I am rather amazed at the large numbers of folks who either (1) Believe in UFOs or (2) Have a personal sighting experinces. First of all, your experience with Roswell was as a photograph for your newspaper. Your feeling was, at the time pictures were being taken, that you saw part of the real materials, which you said had a smell ... did you see any of the ibeam type materials with characters on them ..
that within a day of the meeting with newsmen that General Ramey then changed his attitude and made it into a weather balloon. From: "James Bond Johnson, Ph.D."
Yes, while I had been since 1943 a police reporter for the Fort Worth Star-Telegram I had purchased my own 4"x5" Speed-Graphic press camera after WWII and carried it in my auto trunk for back-up use at night, etc. 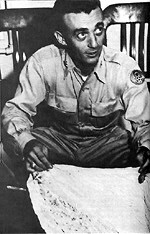 After I returned from WWII service in the AAF I also was the military editor. It was in that context that I was assigned in mid afternoon on July 8, 1947, by my city editor to go out to FWAAF (later Carswell AFB) and get a shot of a 'flying disc' the Air Corps had "captured" and was flying in from Roswell AAF. I now think I arrived at General Ramey's office within less than an hour after the debris arrived and it was for some reason spread out on the carpet in the general's office. As far as is now known I was the only photographer or reporter to see or photograph the debris in the general's office since no one else has been identified as such and no other photos have turned up. A FWAAF PIO phototographer may have taken the Newton photo to accompany the "cover up" story but I do not know any details. Now I do not think there was a "grand scheme" by the AAF to "set me up" with the photo. I have no reason to believe other than that at that time they simply did not know what they had. I am convinced that there was not enough time or expertise (Hollywood set decorators!) at FWAAF to provide a "dummy double" of a "weather balloon" as Kevin Randle has somehow decided. The Rawin kite/weather balloon "cover story" probably was issued by General Ramey live on radio on orders of General McMullen within two hours after I took the pictures and returned to the Star-Telegram to develop and print them. The story was still very live when I returned to the S-T city room but was superseded by the cover story within the couple of hours it probably would have taken to recall to work the air brush artist who would have been needed to retouch the photo for engraving and publication in the a.m. paper (this happened rather routinely). The photo did not run then until the next p.m. editions on 7-9-47. All of the stuff I saw appears in the photos. One of the larger, flat I-beams -- I did not notice any strange markings at the time-- does appear in one of the photos. This was cropped out of the picture published in the paper. Some people also may identify the several "balsa wood kite sticks" (as they later have been described) in the photos as I-beams. Kent Jeffrey told me last week that they are blowing up the negatives now with some new technology to see if any markings appear on the "I-beams." The debris did smell like a burned building (which I experienced frequently as a police reporter). I do not recall any feelings as to its origin or caused to sense anything "out-of-this world." I recall wondering at the time why this stinking stuff was displayed in the Commanding General's office on his nice carpet rather than in a hanger where airplane crashes usually were and are laid out for investigation. I already had gone home and was out of the loop when the "cover story" was issued so I had no reason to question anything announced by Gen Ramey on the radio. There is no record of any formal "press conference." I know that in 1947 as a recently discharged AAF pilot cadet I would not likely have challenged a West Point grad Air Force commanding general's explanation. I am not trying especially to "share" my story but am willing to answer anyone's questions with whatever recollections and evidence I have 50 years later. I have never made a buck off this story other than a few dollars I probably got from the wire services for the photos sent to them at the time. I remember that evening at the city room wishing I had taken a lot more shots since Life and all the photo services and newsmagazines were wanting to buy "exclusive" shots. I am not even listed on the 'web' among the UFO who's who. If any more questions pass them along. The most complete and accurate story is in "3 Hours That Shook the Press" by Shandera and Moore and related articles printed in MUFON and other UFO mags. I would like to include some images of either your picture or the pictures you took for the Texas newspaper about Roswell. also did Berlitz or Moore interview you in their book? I then went to Fort Worth to get "refreshed" on the Roswell Incident. I had not even thought about this incident since the next day after it happened (7-8-47) so my memory was very fuzzy. I read the Star-Telegram for that period filed in the Fort Worth public library. I found out my negatives were housed in the Univ. of Texas at Arlington library archives. I went out there and they were able only to locate two of them at that time. I ordered 8x10s. I understand that now they have located and collated five negatives -- including duplicate shots. I was unsure then how many I had taken. A short time later the historical librarian at UTA contacted me to determine if she could give my phone number to UFO researchers who were inquiring about the photos and ordering prints. I okayed it so was then contacted by Stan and Kevin and Moore-Shandera -- which resulted in many hours of phone and personal interviews. Incidentally, I have never made a dime out of all this! I am not anxious to have my photo included -- I'll let Stan F. do that. I did enjoy my speech last Saturday in Norwalk. There were some of the UFO fanatics there who looked at me as if I was the "Second Coming" since "I was there!" I will appreciate reviewing your copy before it is "published." J. Bond Johnson, Ph.D. has been incurably curious for 70 years. This led to his becoming for five years a reporter-photographer for the Fort Worth Star-Telegram then the South's largest newspaper -- and to pursuing university degrees in journalism, education, theology and psychology at Texas Wesleyan, Texas Christian, Southern Methodist and Claremont. He was a post doctorate fellow of the National Institute of Mental Health for three years of clinical psychiatry training in the post-graduate Department of Psychiatry, University of Southern California School of Medicine. He also received clinical training at the U. S. Public Health Service Hospital in Fort Worth, TCU-VA Veterans Guidance Center in Fort Worth, Metropolitan Hospital in Norwalk, Tri-City Mental Health Authority in Pomona, and Memorial Hospital Medical Center of Long Beach. An inveterate traveler, he has organized and led group tours to six continents in recent years, specializing in "Sentimental Journeys" of former servicemen and women (and widows) to American battlefields around the world. He has received the most attention of late for having photographed in 1947 for the Fort Worth Star-Telegram the wreckage of the controversial "UFO crash" at Roswell, New Mexico. He recently was portrayed in this incident in the movie "Roswell" produced by Showtime. JBONJO@aol.com -or- FAX: (562) 427-3931.